Most osteoarthritis patients are treated with NSAIDs that reduce pain but also have significant side effects, including damage to both articular and nonarticular tissues. Well-formulated natural products can support the body's ability to maintain pain-free joint function while enhancing its ability to maintain normal cartilage and joint structure. Botanicals such as Boswellia serrata, Withania somnifera, and Curcuma longa modulate the immune system to avoid inflammation and help maintain joint health through a variety of pathways. Glucosamine sulfate is well-documented as an effective promoter of healthy joint function, and research suggests that Boswellia enhances glucosamine sulfate's ability to stimulate cartilage cells to maintain normal synthesis of proteoglycans. Glucosamine sulfate is now available in a plant-based form that can be used by individuals with shellfish allergies and those preferring to avoid animal-based supplements. 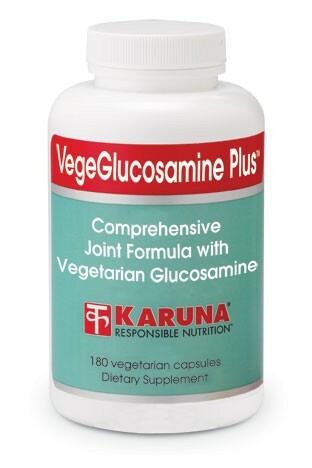 Glucosamine has been shown to help maintain long-term, comfortable function of joint structures. (JAMA 2000; 283:1469-1475; Ann Pharmcother 1998; 32:580-587). Boswellia serrata, Withania somnifera, and Curcuma longa help maintain normal levels of pro-inflammatory cytokines and enzymes such as COX-2. (Curr Op Pharmacol 2007; 7:344-351). Boswellia serrata enhances glucosamine sulfate's ability to maintain normal joint tissue. (Biochem Pharmacol 1989; 38:3527-3534). Ashwagandha helps support normal joint function. (J Ethnopharmacol 1991; 33:91-95). Ashwagandha has been used for thousands of years to enhance resistance to disease. (Herbal Pharmacopoeia & Therapeutic Compendium April 2000). 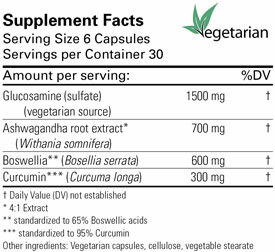 There are over 2600 studies on the effect of Curcuma longa (turmeric) and its constituents. (Biochem Pharmacol 2008; 75:787-809). Suggested use for adults: Six capsules daily in divided doses with meals, or as directed by your health care practitioner. This product is not appropriate for pregnant or lactating women. Consult a physician before use if taking blood thinning medication.